As I mentioned in my previous entry I've been playing around with the idea of making a multi panel world map that can be hung as one piece in multiple different layouts or hung separately as individual continents. This is one version of the finished piece. I have made several different panels, so it can be configured slightly differently but the idea is that you play around with it and move the panels around as the whim takes you! Version one of the world map with all the continents as separate panels. The smaller maps make it slightly awkward to hang so I have experimented with making some larger panels to fill the gaps instead - see below. It's been a lot harder to get the size and layout of the individual maps right and way more work than I originally intended. I thought making a map in multiple parts would give me lots of flexibility but it's also give me the headache of people wanting to buy individual parts and the dilemma of whether or not to split it up! 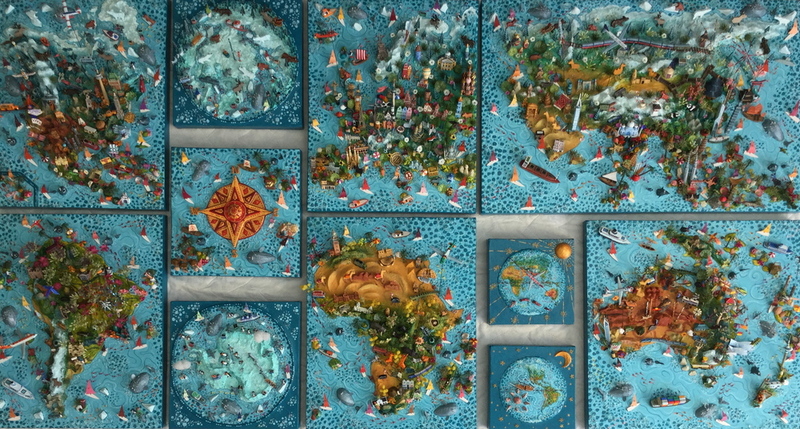 Another version of the world map - this time with large generic panels of sea between the continents rather than the smaller maps. These make the map easier to hang.